I hate “Titanic.” HATE it. I’m not against the Chick Flick or the romance movie in general. Those movies have their place and some of them I actually quite like. Heck, I would probably name at least two Chick Flicks (“When Harry Met Sally” and “Serendipity”) on my list of all time favorites. So that’s not my problem with “Titanic.” My problem is that James Cameron turned it into a romance in the first place. I was obsessed with the story of the Titanic as a kid. There was a book in my school library about the Titanic and I bet I checked it out once or twice a month. So you can imagine how excited the 13 year old version of myself was when he learned there was a movie about the Titanic and it was being made by the man who gave us “Terminator” and “Aliens,” only to find out it was a romance starring Leonardo Dicaprio. That Cameron could turn one of the most fascinating stories in history into a romance still makes me angry. Clearly it was the right choice considering how much money it made. But still, the sting of having a favorite childhood story ripped away and replaced with some old lady throwing a dumb diamond into the ocean is ever present. Boo. And so it was with great fear and trepidation that I entered a theater for a 3-D showing of Cameron’s latest, “Avatar.” The movie follows wheelchair-bound Marine Jack Sully and his pals as he explores an alien world known as Pandora. 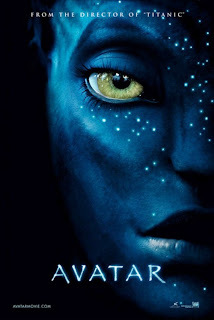 Sully is entrusted with endearing himself to the indigenous people of Pandora, called the Na’vi. To do this, Sully (along with several others) essentially transfers his mind into the body of an Avatar, a combination of Na’vi and human DNA that looks like a Na’vi. Sully quickly finds himself caught between the love for the alien planet he is quickly developing and the mission he has been charged with by the military. Inevitably the two worlds clash and he is forced to choose which side he is really on. Since I’ve bored you with my tale of why I hate “Titanic,” I’m going to skip right to the point: I loved this movie. It is a magnificent piece of work that certainly makes you understand why it took Cameron so long to bring his vision to the screen. “Avatar” is expertly crafted from start to finish and it is the single most beautiful and stunning film I have seen in a long, long time. Not a single scene is wasted, which is no small feat considering its 160 minute run time. In fact I think the case could be made for an extra 20 or 30 minutes of development (looking forward to the director’s cut). The world, the creatures, and the weaponry are all spectacular and the effects are amazing. And whereas I usually find 3-D to be a distraction at best, for this movie it does nothing but add to the spectacle. Cameron uses the 3-D technology, along with the tremendous sound editing, to bring you into the world of Pandora rather than going the standard route of bringing the action out to you. This to me makes a huge difference not only from an enjoyment standpoint but also in regards to respectability. No matter how good a movie this turned out to be, if Cameron packed it with cheesy shots designed to do nothing more than show off 3-D, there is no way it would get the critical respect it has thus far received. It should be noted that, while he is a great director, Cameron isn’t a great writer. The actors in “Avatar” do an admirable job and at times the cast, Zoe Saldana in particular, step up as the driving force behind the movie. But they aren’t asked to do that much. As far as the story goes, there isn’t much that hasn’t been told before. One review I read criticized Cameron for taking the best parts of his other movies and throwing them altogether for “Avatar.” To that I say, so what? Sure, the story isn’t all that original but truth be told, it’s hard to come up with something that hasn’t been done before in some way or another. We’re approaching 100 years of the spoken word in film and complete originality is hard to produce. I have always been of the opinion that it doesn’t really matter if you’re retelling parts of a story as long as you’re retelling it well. And this story, while secondary to the stunning visuals, is well told. I love movies. Whether in the theater or on Blu-Ray/DVD, I see a lot of films every year. Because of that, sometimes I get a little jaded and get caught up in catching as many reasonably interesting movies as I can. Sometimes even good movies start to blend together for me. But there are a few movies that I wish I could see again for the first time. “Star Wars” is one. “Jurassic Park” is another. “Avatar” now takes a prominent place on that list. I saw this movie almost a month ago now and I have thought about it over and over ever since. It is a landmark achievement in film, the kind of movie that you have to believe will have a ripple effect on the rest of the industry. Maybe more importantly, “Avatar” made me feel like a kid again, taking in a fantastic world that I truly did not want to see end when my 160 minutes was up. It reminds me of the magic and the majesty of the silver screen in a way that I haven’t experienced in many years. A+.